Created for photographers searching for alternatives and willing to offer a fresh and distinctive service, capable of distinguishing their artistic personality. 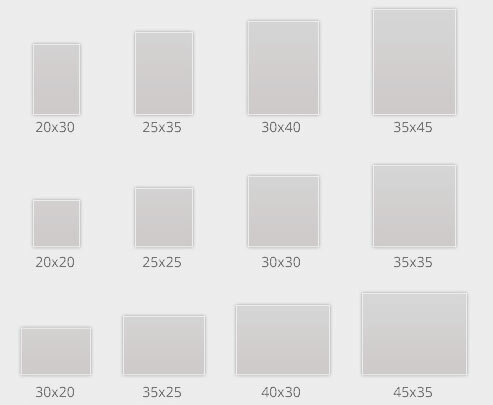 A state-of-the-art product where layouts are the main characters. Young is a book of minimal and rigid lines, composed by different elements combined in a refined harmonic balance of materials and shapes, which become the focal point of a line reflecting the personality of those who choose it. Young Book represents going beyond of a formal and yet unsurpassed limit, where the book was obtained through the creation of thick covers, with a round spines. Today curves disappear, covers get thinner making way to the essential shapes of the box and book for a minimal and simple result which denotes a strong avant-garde taste. Refined materials, special solutions such as our internationally patented seamless binding, the perfectly lay flat opening and the extreme attention to the finishing are the distinctive marks of the Graphistudio Young Book: a memento guaranteed to preserve unaltered through the years, the charm and the emotions of the most beautiful story in the world. The quest for endless innovation has lead us to create emotions before products. The art and passion of the photographers, the sensibility expectations and dreams of the couples, the emotions and amazement of their loved ones… all these feelings take form in a book that you will love at first sight. Graphistudio shapes the dreams thanks to a world-class quality and a style that expresses all the charm of Made in Italy. Young dresses the Wedding Book with the style of its brand: intense colours, distinguished by steady lines and intelligent objects, such as the box and the accessories which complete this range, offer creative expressive chromatic notes. There are many different colour combinations, readyhas to be customized and thus capable of satisfying even the most refined tastes. is authentic and unconventional elegance. A style that expresses new forms, imposing itself as a modern classic based on creativity and craftsmanship. The clear identity of the Graphistudio brand has developed over the years while remaining firmly grounded to its roots. An unmistakeable style that blends a clear inclination to innovation with the strong Italian mark of its origins. Aspects which make up the core of its essence. The Ceconi Line adds value to the products of the Graphistudio range by focusing on design, refinement, elegance and current fashion trends. By coordinating the box, the cover and the inside of the book through textures and contemporary colours, but also by revisiting great classics with a touch of preciousness and thus creating an highly emotional first impression. Endless solutions that can be managed by the photographer by creating exclusive lines and by emphasizing a well defined style. 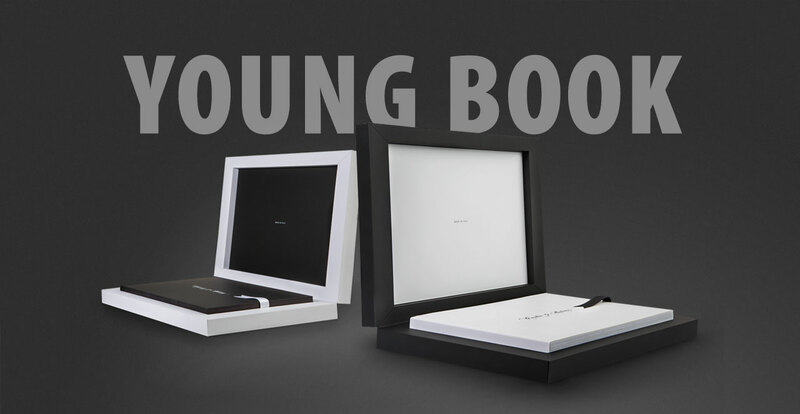 Young Book in the Ceconi version enhances itself thanks to its superb elegance, obtaining a unique and unmistakable identity. 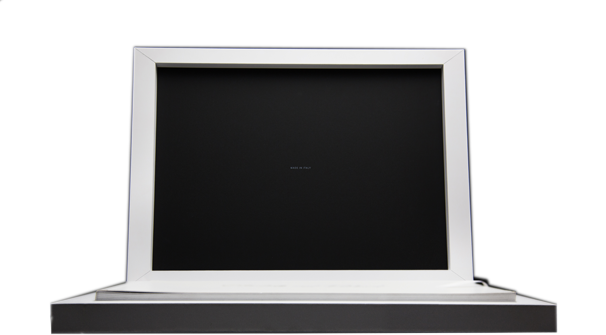 The range of sizes goes from the majestic 35×45 cm, to the classical 30×40 cm, down to the compact 25×35 cm and 20×30 cm. The corresponding landscape and square versions are also available. 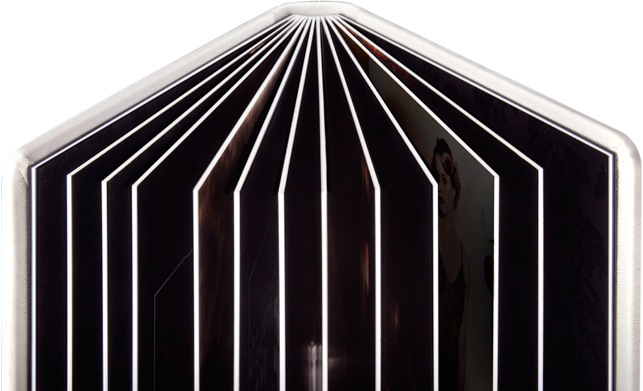 You can choose the photographic or the metallic paper with digital laser printing, or as an alternative, Tintoretto and Photo Fine Art papers with digital offset printing. The real connection between digital and traditional worlds. Pages become very rigid, in every inch similar to the traditional albums. What on all books is an option, in the YOUNG BOOK is a standard, which confers majesty to the book by adding an insert between the pages. 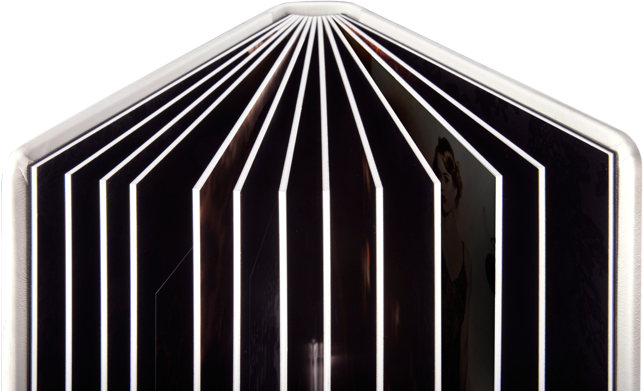 To enhance and preserve the high fidelity of the book prints, Graphistudio has invented and patented a revolutionary binding system, whose superior quality is literally self evident. The perfectly lay-flat opening allows a panoramic and detailed view of the whole spread, including the parts positioned over the seam. The result is a nearly cinematographic, captivating experience. The refined “mechanics” of the block guarantees a fundamental requisite for such an important memory: quality unalterable throughout the years. Is the distinguishing element of the new YOUNG BOOK, which becomes an icon of minimalism. Blended with the block, assumes a primitive look and it fits perfectly the box generating new combinations through the style, the form and the values. 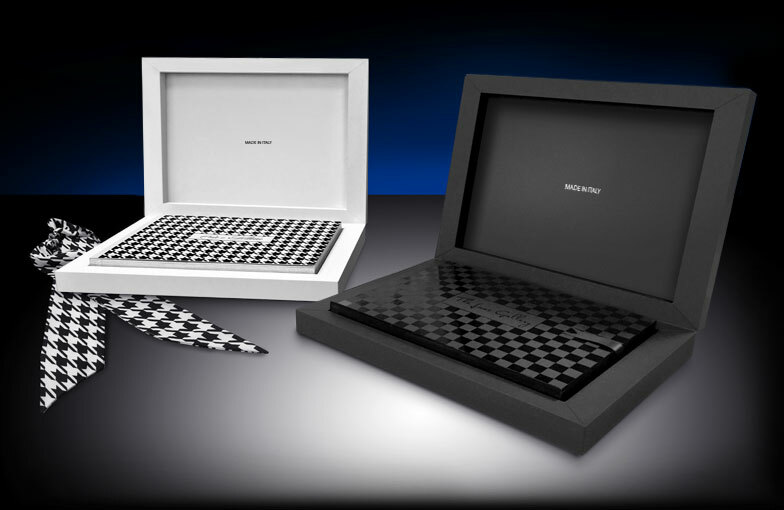 The cover can be upholstered either with the same materials and colours of the box, or with different ones, that create unprecedented chromatic harmonies. It plays with your perception using ancestral shapes, to create a new balance between full and empty spaces carved out from the solid to host the precious imagery of a wedding as in a chest. The outcome is the essential, which through sober lines creates a different attitude on the wedding book defying conventional ideas. 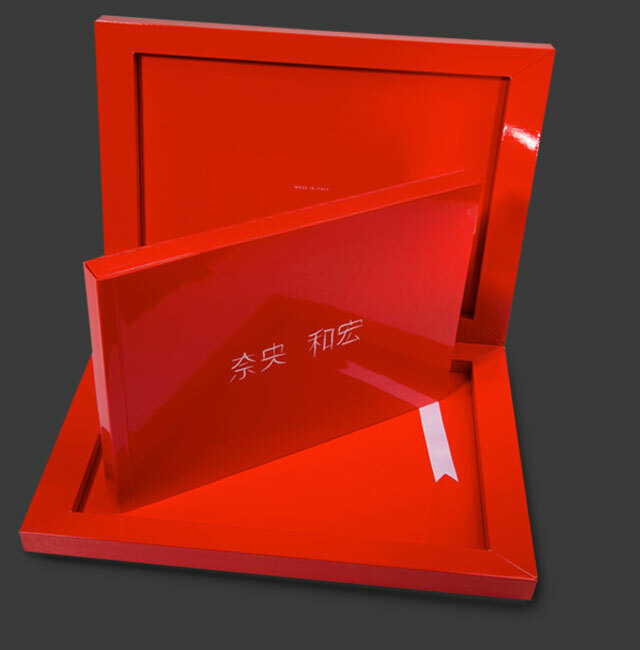 The Box represents a key factor for the Young Book success, therefore it is offered in bundle as default. The clear cut lines reflect into its rigid and compact shape. As the cover, it can feature the same finishings and colours, for unprecedent chromatic armonies. 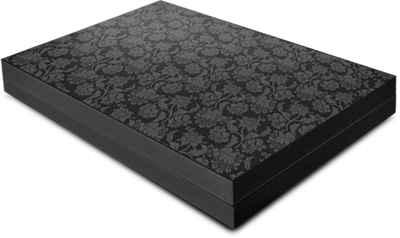 The covering of the outside and inside of the box can be diversified for what concerns both the materials and the colours. Both the box and the cover can be ennobled by colour overprinting and selective raised varnishing. Meanders, textures, and texts can be impressed, blending with the many tones available for the materials.